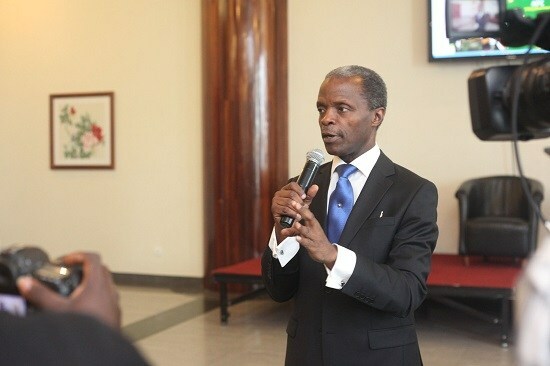 The Vice President of the nation, Yemi Osinbajo stated that the Buhari-led government was focussed on transparency and accountability in their government and that these are values that will be upheld to the very end. The Vice President was speaking at the Open Government Partnership (OGP) Week, which held at the NAF Conference Centre, Abuja, on Monday, May 7, 2018. He stated that the fight against corruption was still on, but that it was on the way to being won. In a statement which contained the full speech shared with theHerald ng, Osinbajo spoke on the ways in which the Buhari government has battled corruption and promised that the government would always be one of fairness and accountability. It really is a special pleasure to be here with you, as we commence the Open Government Partnership Week in Nigeria. Our government came into office on the back of a three-pronged agenda, one ensuring security, two rebuilding the economy, and third, vigorously prosecuting the fight against corruption. This last issue, corruption, has been an existential issue for Nigeria, threatening the very fundament of our existence. It has ensured that, for too long, the resources meant for the majority, have been cornered by a greedy minority. This issue of corruption underlines every aspect of our national life, from our security situation to the state of our economy. It was the reason why, in spite of record oil revenues between 2011 and 2013/14, we saw no savings, and very little investment in infrastructure and jobs, and, in spite of the billions of dollars reportedly invested in security, the Boko Haram insurgency and other cases of insecurity did not abate. Our government has adopted a two-step approach to dealing with this scourge of systemic corruption. The first is to stop grand corruption and the accompanying impunity. The second step and the more enduring one, is what this week is about, creating a self- sustaining system that assures transparency and accountability. We have, since we assumed office three years ago, made remarkable progress in pushing the frontiers of transparency and accountability in the Federal Government. One of the first things that the President did when we took office was to establish the Presidential Advisory Committee Against Corruption (PACAC), to coordinate our reform efforts in this regard. We inherited a Treasury Single Account (TSA) system that existed mainly as an idea, without any committed implementation. Since the Presidential Order by President Buhari in August 2015, we have made remarkable progress in expanding the reach of the TSA, so that today, we are almost at 100 percent compliance. The London Anti-Corruption Summit in May 2016 was an important milestone for us, in our anti-Corruption efforts, because it helped crystallize various national commitments into an effective multinational anti-corruption coalition. It was at that conference that Nigeria committed to joining the OGP, and we fulfilled this commitment in July 2017 when we became the 70th country to join the Open Government Partnership (OGP), an international multi-stakeholder initiative, focused on improving transparency, accountability, citizen participation and responsiveness to citizens through technology and innovation. Following this, President Buhari constituted the OGP National Steering Committee (NSC), with the Federal Ministry of Justice as the Coordinating Ministry. The OGP Nigeria has since developed its first National Action Plan (NAP) of fourteen commitments with focus on four thematic areas of Fiscal Transparency, Anti-Corruption, Access to Information and Citizens’ Engagement. One of the remarkable things about the OGP is that it was designed to function as a partnership between the governments and the private sector. Without this coalition-building, I doubt that much progress would be achievable. Regardless of whether the goal is improving infrastructure or fighting corruption, it is clear, as it has always been, that governments cannot do it alone. The skills, experience, resources and technology that the private sector brings to the table, are often invaluable and in many instances represent the difference between success and failure. We ought to equally acknowledge that there is a limit to what civil society by itself can accomplish by itself, without building bridges with the public sector that is very often the target of its work. What our experience with OGP in Nigeria has proven, is that it is possible to build a coalition of like-minded reformers drawn from government and non-state actors. In addition to joining the OGP, and developing a National Action Plan in 2016, the Federal Government also established a Presidential Initiative on Continuous Audit (PICA), housed in the Federal Ministry of Finance, to clean up the Federal payroll and pensions systems, across all our Ministries, Departments and Agencies. PICA’s work in this regard has helped the Federal Government save more than N200 Billion by eliminating ghost workers. Like the TSA, we are also aggressively expanding the rollout of the Government Integrated Payroll and Personnel Information System (IPPIS), to ensure that the loopholes that enable payroll fraud are permanently blocked. PICA also oversees the Whistleblowing Programme we launched in December 2016. That Programme had seen recoveries of N7.8 billion, $378 million and 27,800 pounds sterling, as at March 2018. Nigeria’s experience has shown that technology and innovations, as well as social media platforms, are changing the ways in which citizens engage with government, and empowering citizens and non-state actors to take a more active role in holding government to account. On our part, the Buhari administration is also actively leveraging technology in a way no previous government in Nigeria has, to underpin the President’s commitment to accountable governance. Indeed, much of the focus of the OGP is on the ways in which technology can help scale up the impact and reach of public sector anti-corruption and transparency initiatives. I’ve spoken previously about our work expanding the Treasury Single Account (TSA) and the Integrated Payroll and Personnel Information System (IPPIS). A National Open Contracting Platform (NOCOPO), developed by the Bureau for Public Procurement, has become operational and is currently being piloted in a number of government institutions. Similarly, the Infrastructure Concession and Regulatory Commission (ICRC) launched its Public Private Partnerships (PPP) Contracts Disclosure Portal in September 2017, to ensure the timely disclosure of contract information from project initiation through to implementation. The Budget Office of the Federation, in line with global best practice and Open Budget Survey Index, also developed the citizens ‘I-Monitor’ Portal which enables citizens across the country to access budget information in real time and to monitor projects while encouraging proactive feedback to the government. An Open Contracting Working Group made up of civil society organizations and government institutions, are working together to enhance citizens’ access to, and understanding of procurement information. Civil Society Organisations are also taking the lead in interesting ways. Take the example of BudgIT, a civil society partner that works on transparency in budgeting and tracking of government expenditure, using technology and graphic design. BudgIT has also developed Tracka.ng, a tool that enables citizens to share updates on budget implementation in their communities. The Public and Private Development Centre (PPDC) has led the way in the development of ‘BUDESHI’, a technology platform that will assist non-state actors to monitor ongoing procurements. Distinguished Ladies and Gentlemen, one of the important areas of progress is the ongoing effort to establish a public register of beneficial owners. It is our hope that this will help bring to an end, the era of anonymous company ownership which aids capital flight, illicit financial flows and tax evasion. The Nigeria Corporate Affairs Commission (CAC) is working closely with the Government of the United Kingdom and the Open Ownership – a global project, whose aim is to build an Open Global Beneficial Ownership Register – to develop Open Ownership Data Standards to achieve this goal. Since we joined the OGP, access to public information premised on the Freedom of Information (FOI) Act enacted in 2011, has improved significantly. I am told that at least 106 government institutions now have designated FOI Desk Officers, to ensure speedy responses to information requests in compliance with the (FOI) Act and the commitments we have made under the Nigeria OGP National Action Plan. We have set up a Presidential Committee on Asset Recovery (PCAR), and developed procedures and guidance to ensure that all recovered funds are paid into a single Central Bank Asset Recovery account, for improved transparency and ease of management. The Federal Government’s agreement with the Swiss Government on the return of looted funds traced to former Head of State General Sani Abacha, led to the remittance of US$322 million in December 2017. This historic agreement also includes CSO monitoring of the utilization of the returned asset. I must acknowledge the role played by The Africa Network for Environment & Economic Justice (ANEEJ) in the negotiation of this agreement and leading of other CSOs in monitoring the utilization of the fund. Since 2017, our annual national budgets have included a line item on revenue generated from asset recoveries. All funds forfeited to the Federal Government are being included in our yearly budget proposals, for appropriation by the National Assembly. We have also committed to investing these recovered funds on Infrastructure projects and our National Social Investment Programme. In addition, we have submitted a Bill to the National Assembly for the purpose of enacting a more comprehensive legislation on proceeds of crime. The successes recorded from the implementation of the OGP framework, have contributed in no small measure to the improvement in the perception of Nigeria’s business environment by investors, businesses, and the international community. Through the work of the Federal Ministry of Industry, Trade and Investment, and the Presidential Enabling Business Environment Council (PEBEC), who are also members of the OGP National Steering Committee, Nigeria moved 24 places up on the World Bank’s 2017 Doing Business Index. The reforms, many of them heavily dependent on technology, have seen business registration time, reduced to under 48 hours, simplified processes for paying taxes and obtaining Nigerian visas, and improved access not just to credit by businesses, but also to credit information by potential lenders. The reforms have also led to the passage of landmark reform legislation like the Secured Transactions in Moveable Assets Act of 2017 and Trading Reporting Act 2017. As we make progress at the federal level, we are also working with the States, through the subnational engagement framework, under the OGP National Action Plan, to improve transparency, accountability and citizen participation at other levels of governance. I am delighted to note that Kaduna State has not only developed its OGP State Action Plan, which was approved by the State Executive Council early this year, it has also become one of the first pilot states adopted from Nigeria by the OGP International. I am equally delighted, that our efforts in fighting corruption and deepening good governance are being recognized and applauded globally. I have been told by the OGP Secretariat, that Nigeria was this year, elected into the global steering committee of the Open Government Partnership (OGP). And then there was the designation, in 2017, of President Buhari as the African Union’s 2018 ‘Anti-corruption Champion’. This is yet another testament to the hard work and political will that this administration has demonstrated in the fight against corruption, even in the face of great resistance. There is no doubt that governments which seek to earn and sustain the trust of citizens, must learn to maintain high standards of transparency. The role of the OGP, in pushing for and achieving these high standards is evident, and wholly deserving of commendation. Let me, on behalf of President Muhammadu Buhari, extend our sincere gratitude, to all those who have made today possible, particularly the OGP Steering Committee, Attorney General of the Federation and Minister of Justice, who is also the co-chair and the non-state co-chair of the OGP National Steering Committee, members of the OGP National Steering Committee made up of non-state actors, government institutions and the OGP Secretariat. Distinguished participants, as we deliberate this week on the progress made by the OGP Nigeria, develop new ideas for future work to expand civic engagements, I encourage you to come up with policy recommendations that can radically help in further opening up Government at all levels in Nigeria. We look forward to receiving the final report and recommendations at the end of this week. I thank you for your kind attention. Just before I sit, I have the very distinguished pleasure of presenting the OGP Nigeria National Action Plan, 2017 – 2019. Thank you very much.